The Fagor Duo Pressure Cooker is one of the most versatile and time-saving cooking tools you can have in your kitchen. 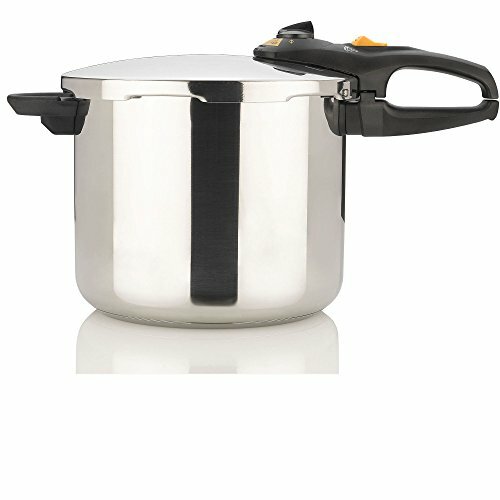 Constructed from 18/10 stainless steel for long-lasting durability with an aluminum encapsulated bottom that guarantees even heat distribution, this pressure cooker is complete with two pressure settings (LOW and HIGH) giving you the flexibility to cook even the most delicate dishes and can be used on any cooktop, including induction. Sleek and ergonomically designed handles make for easier opening and closing and is also equipped with a safety-lock, pressure indicator and pressure valve. This unit creates meals in 70% less time, maintaining the natural color, essential nutrients and flavor of foods for healthier dining. Vegetables are ready in two minutes, risotto in less than 7 minutes, soup, stew, chicken or beef in as few as 10 minutes. The Duo Pressure Cooker has been voted Best Buy in Leading Culinary Magazine and Top Choice on National Culinary Cooking Shows. Cook food 70% faster with this advanced, energy-efficient pressure cooker. One touch energy-efficient operation with lid that self-locks at the flip of a switch. Safety-lock on handle, pressure valves control pressure and prevent premature opening. Two pressure settings, HIGH (15 psi) for cooking meat and LOW (8 psi) for delicate foods. Pressure indicator with valve signals to gauge pressure and determine when to increase or decrease burner heat. 18/10 stainless-steel with aluminum-encapsulated base for even heat distribution, cooking consistency and energy efficiency. Helper handle for easy transport. Fast: Reduces cooking time up to 70%. Favorite recipes easily adapt and cook in one third of the time. Easy: Extremely easy to operate. Just load ingredients, lock lid in place and begin cooking. Release pressure and enjoy healthy, flavorful meals. It is that easy! Healthy: Create delicious meals while retaining important water-soluble vitamins and minerals. Steam vegetables in a flash or cook beans and grains super-fast with little or no pre-soaking involved. Cooks without oil. Maintain the natural color and flavor of foods. Safe: The Fagor Pressure cooker is equipped with three independent pressure release mechanisms. If the unit is left unattended the main valve will begin to release excess pressure, next the safety valve will assist in releasing pressure and finally the gasket will protrude from the notch located on the side of the lid. Moreover, pressure will never build up if the safety lock has not been moved to the closed position. Once the pressure indicator has popped up, it will automatically block this safety lock, not allowing you to move it to the “open” position until all the pressure has been released. Stainless-steel pasta/steamer basket insert, support trivet. More Than 50 Recipes cookbook. Instruction booklet features cooking times, cooking conversion guides for traditional recipes, and high-altitude tips. Fagor is the leading pressure cooker brand in the United States and it has been present on the market for 25 years. The Duo has been named "Best of the Test" by Good Housekeeping Magazine. Most eco-friendly and energy efficient way of cooking: reduces cooking time by up to 70% and fast cooking translates to less energy consumption. Spring type mechanism with two pressure settings--low (8psi) and high (15psi)-Sleek black handles are ergonomically designed to make for easier handling. Made of 18/10 stainless steel; works with all cooking surfaces, including induction. Also Includes Recipe Book. The highest standard in safety systems that have been tested and approved in Europe and the US by UL and Bureau Veritas laboratories.